Last week on Instagram I posted a computerized video of the obliques in a twist. You can see it here. 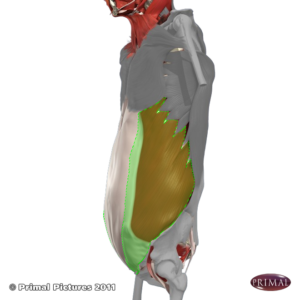 It shows how the obliques are the engine and primary driver when rotating the torso. This is important to understand, and to feel. So many people in yoga, and elsewhere, over-use their arms to pull into a twist. With this over-leveraged movement, it is too easy to go further than is available. Blowing by any whispers, or indicators, and missing the opportunity to make true progress. It is a big reason why twists can often lead to SI joint issues, rib issues, neck issues and more. It’s also a reason why many teachers say to move the pelvis when twisting. They say it is safer. They aren’t wrong. But it also can prevent an efficient use of the obliques as the driver, the engine, the initiator of the movement. It is a classic case of trying to solve the problem that isn’t. Without efficient use of the obliques we are missing a big piece of functional movement. This can lead to psoas issues, QL issues, poor hip mechanics, poor breathing. Not to mention poor core stability. (and interestingly SI, Rib and Neck issues). It also puts a huge damper on reducing pain, and making significant gains in how we move. And most importantly it can put a kibosh on all that we could be capable of. Just think what could be possible if your twists were actually driven by the obliques? Think digestion, think walking and running, think stair climbing, lifting your kids, golfing, skating, cross-country skiing . . . . Here is the thing. Twists are powerful. Especially when we allow the obliques to be the engine. In more ways than you can imagine. If you want to dig into this more, here are two ways. Read: I wrote a whole chapter on twists in my book Anatomy and Asana: Preventing Yoga Injuries. You can get a copy here. Watch: Explore videos in Susi’s Resource Library. I have many on the obliques, twisting, core stability and more. View more details are here.